The Crown Revolution: Are You Confused? 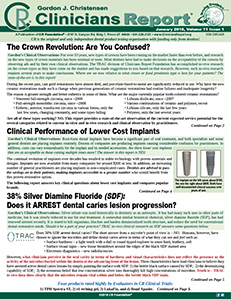 TRAC Research: 38% Silver Diamine Fluoride (SDF): Does it ARREST dental caries lesion progression? • Do lower cost implants perform as well as premium brands? • Why is there reluctance to place different implant brands?